Pete Salinetti stands in front of some of the beautiful crops he is growing by precise successions in Western Massachusetts on October 2. The Berkshires, formed as they were some 300 million years ago by the collision of the supercontinents containing North America and Africa, have had time to adjust. The intense pressure of the tectonic forces that buckled and folded bedrock into fused slabs has dissipated. Millions of years of rain and wind have eroded the jagged peaks that were forced up. Freezing and thawing have cracked and splintered their surfaces. Slowly life has arrived, with its microbial acids and enzymes, and further degraded the rock until now a thin coating of soil covers it and what were mountains are now not much more than steep hills. The collision has left its mark, however, in exposed geological formations everywhere. Some have attracted the attention of commercial developers and become quarries and mines, especially the deposits of marble and the mile-wide belts of dolomitic limestone present in 500 to 800 foot thick layers. It was the former of these that brought Pete Salinetti’s family to the area over a hundred years ago. Pete grew up in Lee, next door to his grandfather, where his family had an extensive garden. 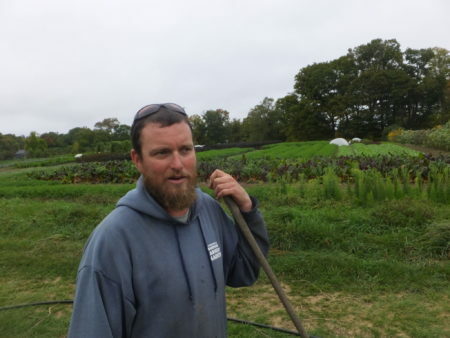 He never thought he would farm for a profession, but he loved to garden and grew ornamentals and perennials, including orchard fruit. Central Massachusetts is not what you would call prime farmland. Like most of New England that isn’t blessed with a nearby waterway and thus alluvial deposits, our soils are thin and only farmable where the underlying landforms aren’t too rocky, hilly or wet to grow crops. When Julie and I bought this land 36 years ago it was composed of two played-out hayfields that had been de-rocked years ago and about 30 acres of woods that had not. Since then we have put drain tile under the fields to get them plantable by April, brought or grown onto them uncountable tons of organic matter to build soil, and hauled from them an equal volume of rocks that the first team of de-rockers somehow missed. We have yet to deal with the underlying abundance of potter’s clay and ledge. 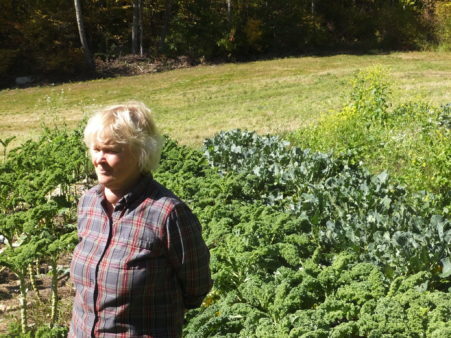 The big advantage to central Massachusetts, we told ourselves, was that the land was so unattractive to farmers that we didn’t have to worry about spray drift or chemical contamination by neighbors, a huge concern where Julie grew up in Illinois. Since then we have built a serviceable farm here, certified organic since 1987 and are providing produce and small and orchard fruit through a CSA to some 60 families currently, and to several wholesale accounts. We also raise a number of animals and sell meat and eggs, mostly to individuals.